Like the previous iteration, Pokémon Scramble U contains all currently available Pokémon, bringing an addition of Keldeo, Meloetta and Genesect, allowing for a massive amount of collection. 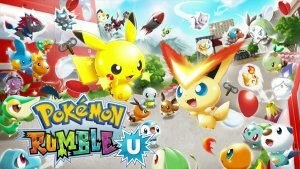 As this game is on a home console, it has the functionality brought by having an increase in power and allows for up to 100 Pokémon to battle you at any one time. It also allows for you to play the game with up to three friends at the same time, to battle various enemies. The game also utilises the Wii U GamePad's Near-Field Communication sensor and allows for you to scan in various special figures to gain a bonus Pokémon toy in the game.